The first time I visited Dakar was in September of 2009 and I managed to get a small tour of the city. 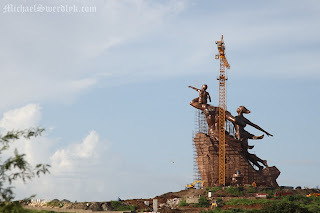 At the time, they were in the midst of constructing the Monument de la Renaissance Africaine, a 49m tall bronze statue (the tallest statue in Africa apparently). The (now former) president, Abdoulaye Wade, commissioned the statue which ended up costing $27 million to build. In a country with the issues that Senegal is facing, I'm pretty sure that expenditure wasn't greeted with too much enthusiasm. On my last trip through Dakar, this past month, I managed to get back into the city, and see the monument once more. Wade is gone and the current government is in a financial crisis. But hey, look, the statue's finally got a head.